Brady Bacon takes the checkered flag at the Texas Motor Speedway dirt track on Saturday night. FORT WORTH, Texas _ Oklahoman Brady Bacon added a victory at the Texas Motor Speedway Dirt Track to his Lucas Oil American Sprint Car Series resume Saturday night, claiming the 30-lap A-Main Feature of the Tony Stewart presents the Vankor Texas Sprint Car Nationals. Three attempts at the green were followed by a quick red flag for Wayne Johnson, who was unharmed after flipping off Turn 2. The chase at the front involved Sam Hafertepe Jr., who led race organizer Tony Stewart and Seth Bergman. Things went awry in an instant for Hafertepe while working Lap 7, as contact with another driver’s right rear tire resulted in the No. 15h flipping into the Turn 4 wall. Hafertepe, who swept last year’s spring event here, was uninjured but unable to continue. Avoiding the crash, Stewart positioned his Rush Truck Center No. 14 at the front of the line. Steadily pulling away after the restart, traffic came into play after the 10th lap. Working past Bergman for the runnerup spot, traffic played into the advantage of Bacon as the No. 28x blasted into the lead on Lap 13. Caution flew on Lap 15 as a line came apart on the power-steering of Bergman’s No. 23. 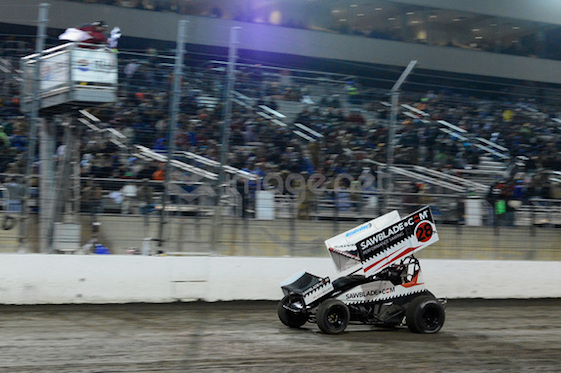 The restart put Sammy Swindell into the mix with Stewart as Bacon turned up the heat. Steadily pulling away, the race for second went to Swindell as Stewart slowed with mechanical issues that sent the No. 14 to the Pits on Lap 21. Remaining under green the remainder of the race, Bacon ran to the checkered flag 2.171-seconds ahead of Swindell with Johnny Herrera rounding out the podium in the Mesilla Valley Transportation No. 45x. Racing through the first B-Feature, Travis Rilat stormed ahead 13 positions to earn the CP-Carrillo Hard Charger of the Night with Brandon Hanks crossing fifth. Starting from 18th, Skylar Gee rolled to sixth with Jamie Ball also making moves on the field from 16th to seventh as Derek Hagar crossed eighth. Robbie Price finished ninth after starting 21st with Roger Crockett completing the top-10. Stewart, the retired three-time Monster Energy NASCAR Cup Series champion and co-owner of Stewart-Haas Racing, was a DNF in 15th. Another field of 35 drivers made the call for the second night of racing. Heat Race wins went to Bacon, Christopher Bell, Brandon Hanks and Herrera. Oklahoma native Bell completed a busy day after finishing second to Ryan Blaney in the NASCAR Xfinity Series My Bariatric Solutions 300 on TMS’ 1.5-mile oval. B-Features were topped by Matt Covington and Gee. One Regional Provisional was used by Alex Sewell. Up next of the Lucas Oil American Sprint Car Series presented by Sawblade.com are three new tracks for the National Tour _ Paducah International Raceway in Paducah, Ky., on April 27, followed by Williams Grove Speedway in Mechanicsburg, Pa., on May 4, and Selinsgrove Speedway in Selinsgrove, Pa. on May 5. Heat 1 (8 Laps): 1. 28X-Brady Bacon, ; 2. 17-Derek Hagar, ; 3. 17W-Harli White, ; 4. 05-Zane Hendricks, ; 5. 76-Zane Lawrence, ; 6. (DNF) 7M-Chance Morton, ; 7. (DNF) 8M-Kade Morton, ; 8. (DNF) 77X-Alex Hill, . Heat 2 (8 Laps): 1. 31B-Christopher Bell, ; 2. 11-Roger Crockett, ; 3. 52-Blake Hahn, ; 4. 95-Matt Covington, ; 5. 28-Scott Bogucki, ; 6. 5X-Tyson Hall, ; 7. 9-Bobby Breen, ; 8. 56X-Mark Chisholm, . Heat 3 (8 Laps): 1. 84-Brandon Hanks, ; 2. 91T-Tyler Thomas, ; 3. 1J-Danny Jennings, ; 4. 99-Skylar Gee, ; 5. 21-Robbie Price, ; 6. 12H-Tony Bruce Jr., ; 7. 44-Chris Martin, ; 8. 26M-Fred Mattox, . Heat 4 (8 Laps): 1. 45X-Johnny Herrera, ; 2. 2C-Wayne Johnson, ; 3. 5J-Jamie Ball, ; 4. 1-Travis Rilat, ; 5. 8-Alex Sewell, ; 6. 12W-Dale Wester, ; (DNS) 6-Dustin Gates. B-Feature 1 (12 Laps): 1. 95-Matt Covington, ; 2. 1-Travis Rilat, ; 3. 28-Scott Bogucki, ; 4. 8-Alex Sewell, ; 5. 12W-Dale Wester, ; 6. 05-Zane Hendricks, ; 7. (DNF) 9-Bobby Breen, ; 8. (DNF) 26M-Fred Mattox, ; (DNS) 7M-Chance Morton, ; (DNS) 77X-Alex Hill. B-Feature 2 (12 Laps): 1. 99-Skylar Gee, ; 2. 12H-Tony Bruce Jr., ; 3. 21-Robbie Price, ; 4. 76-Zane Lawrence, ; 5. 5X-Tyson Hall, ; 6. 44-Chris Martin, ; 7. 6-Dustin Gates, ; 8. 56X-Mark Chisholm, ; 9. 8M-Kade Morton, . A-Feature (30 Laps): 1. 28X-Brady Bacon, ; 2. 3-Sammy Swindell, ; 3. 45X-Johnny Herrera, ; 4. 1-Travis Rilat, ; 5. 84-Brandon Hanks, ; 6. 99-Skylar Gee, ; 7. 5J-Jamie Ball, ; 8. 17-Derek Hagar, ; 9. 21-Robbie Price, ; 10. 11-Roger Crockett, ; 11. 17W-Harli White, ; 12. 1J-Danny Jennings, ; 13. 52-Blake Hahn, ; 14. 12H-Tony Bruce Jr., ; 15. (DNF) 14-Tony Stewart, ; 16. (DNF) 91T-Tyler Thomas, ; 17. (DNF) 8-Alex Sewell, ; 18. (DNF) 23-Seth Bergman, ; 19. (DNF) 31B-Christopher Bell, ; 20. (DNF) 15H-Sam Hafertepe Jr., ; 21. (DNF) 28-Scott Bogucki, ; 22. (DNF) 2C-Wayne Johnson, ; (DNS) 95-Matt Covington. 2018 ASCS National Driver Points (Top-15): 1. Sammy Swindell 399; 2. Sam Hafertepe Jr. 376; 3. Johnny Herrera 364; 4. Seth Bergman 354; 5. Blake Hahn 345; 6. Danny Jennings 330; 7. Wayne Johnson 326; 8. Roger Crockett 325; 9. Jamie Ball 319; 10. Scott Bogucki 319; 11. Skylar Gee 37; 12. Robbie Price 314; 13. Harli White 309; 14. Matt Covington 305; 15. Tony Bruce, Jr. 295. 2018 ASCS National Tour Wins: Roger Crockett – 1 (3/16 – Devil’s Bowl Speedway); Seth Bergman – 1 (4/6 – Texas Motor Speedway); Brady Bacon – 1 (4/7 – Texas Motor Speedway).